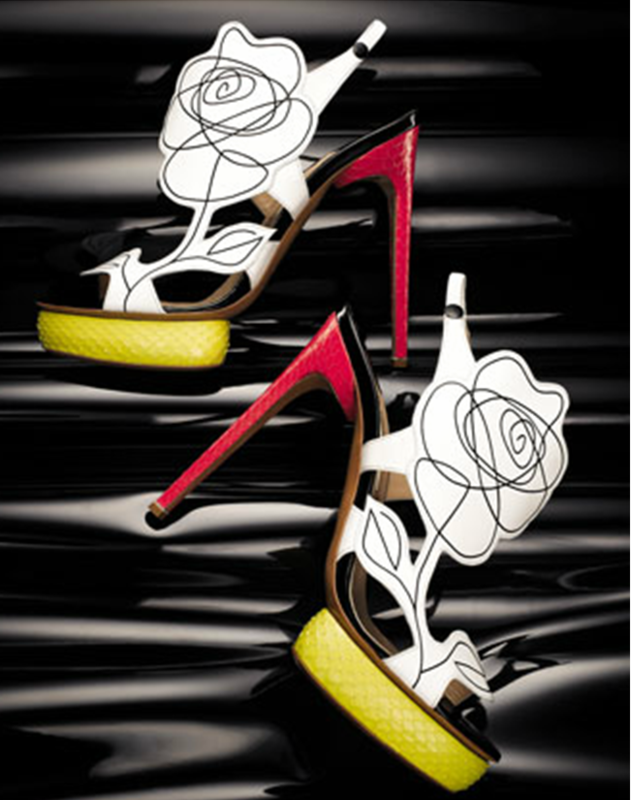 Today's So Shoe Me is the Scribble-Flower Colorblock Sandal by Nicholas Kirkwood, $1250, available at Bergdorf Goodman. Floral prints have b(l)oomed and Nicholas Kirkwood has given the trend a graphic and artistic twist in his "Scribble" sandals. The quirky and statement making flower on each shoe has a sketchbook quality for a personalized detail that takes you into the mind of the designer. The black and white upper lets the bright 5.5" red heel and 1.2" yellow platform pop for the ultimate colorblocked style. The perfect signature style with texture, shine and bold graphics make this one-of-a-kind heel worth the designer splurge. Pair these heels with a curve hugging deep purple dress for an unexpected look for a fun evening out. So Shoe Me a pair of artistic floral sandals with an eye-popping colorblocked design and whimsical sketchbook feel for a collectable designer shoe that will keep my style in bloom.